Sangh will speed up work on Village Development and Family Education : Suresh Bhayyaji Joshi. ” Two thirds of the shakhas of the Rashtriya Swayamsevak Sangh are in villages and one third are in the towns. This is because about 60% of the population of India lives in the villages. In today’s world, there are many challenges in the preservation of villages. The Akhil Bharatiya Karyakarini Mandal resolved that much more work needs to be done in the villages through the RSS Shakhas. The question of social integration is a major and immediate challenge. Inspite of the vast expansion of information media there is still a large gap in communication of appropriate and accurate information to the villages. Much work needs to be done to carry correct information and perspectives to villages. At the end of a three day meeting of the Akhil Bharatiya Karyakarini Mandal , Sarkaryavah, Shri Suresh Bhayyaji Joshi addressed a press conference. Dr. Manmohan Vaidya, the Akhil Bharatiya Prachar Pramukh also was present at the conference. Shri Bhayyaji Joshi said, that the Akhil Bharatiya Karyakarini Mandal has considered the issues of village development and family education and upon these deliberations a program for addressing these issues has been developed. For a long time now farmers and villagers have been grappling with very pressing problems. The Sangh believes that farmers have to be made self reliant. The government must closely consider and intimately understand the issues that face the farming community and frame policies that closely match the priorities of the farming community. He said that farmers must be made prosperous and economically autonomous. So the government policy must ensure that farmers will receive a fair, appropriate and full price for their produce. He also said that to work for village development the Sangh will actively involve volunteers in the 30 – 35 years age group. The Sangh has resolved to strengthen the family through an active policy of family education. The family is very important in the forming of individual character. Character development in children is most effective when the proper samskaras are received from the family. Swayamsevaks work to ensure that families become the source of social enlightenment. Through social work, the Sangh has reached about 20 lakh families. Through this work about 1.25 crores of people have come into contact of Sangh. To bring good samskaras into the country, family education is the most important work. These issues have been considered in the Akhil Bharatiya Karyakarini Mandal and a final program will be formed in the Pratinidhi Sabha to be held in March. Sarkaryavah Shri Bhayyaji Joshi, responding to a question, said that the question of the Rohingyas is a most important one. We have to understand why they are being expelled from Myanmar. There are other countries too that border Myanmar. Why did not those countries allow the entry of Myanmar Muslim refugees. We also have to identify the areas where these Rohingya Muslims have already settled in India. They have chosen Jammu and Kashmir and the city of Hyderabad to stay. From their behaviour it is clear that they have not come here to seek refuge. The government must have a clear and coherent policy on how to deal with refugees. The policy must have clarity about the conditions of the refuge, their location and the period of such refuge. We must have a policy for the return of these refugees to their home countries at an appropriate time. Bharat has always welcomed and treated refugees very generously. But before we welcome these refugees, we must check their antecedents. There are limits to the argument for human compassion. He emphasised that, the advocates of the rights of Rohingya Muslim refugees must closely consider the antecedents of these groups. 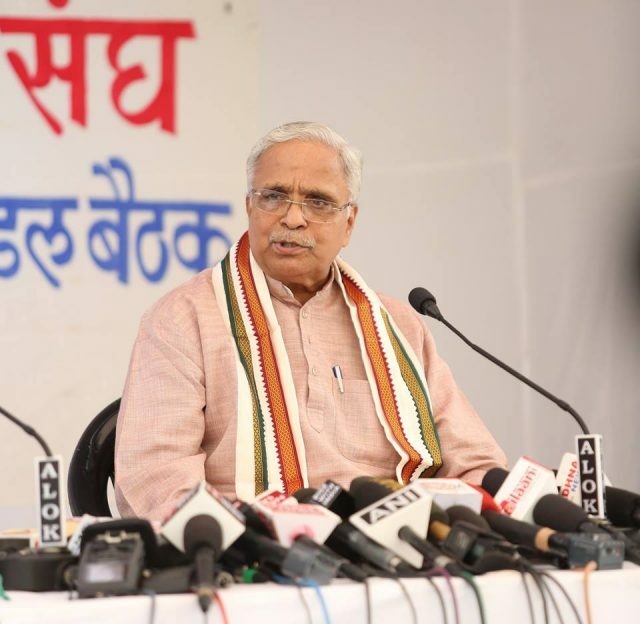 In response to a question on the Ram Mandir, Shri Bhayyaji Joshi said, that the Sangh desires that all the obstacles with regard to the mandir must first end. The Mandir can then be built. The government must work towards clearing all such obstacles. At the moment a lot of work towards the construction of the Ram Mandir is going on at Karseva Puram. As soon as the obstacles end, the construction of the Ram Mandir will start. Talking about the question of reservations, he said that, reservations must continue until the objectives for the program as set down by Babasaheb Amdedkar are fulfilled. It is for the the beneficiaries of the reservation system (the disadvantaged sections of the society) to decide for how long they need reservations to continue. Note : Above is a Translation of Hindi Press Release of RSS ABKM2017 Press meet proceedings. This entry was posted in Nation, RSS and tagged ABKM2017, Hindutva, RSS on October 20, 2017 by arisebharat.